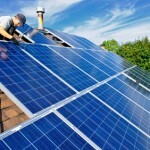 Could Graphene improve solar PV efficiency? A professor at Michigan Technological University (MTU) claims that Graphene could improve the efficiency of solar photovoltaic panels by more than 50 per cent. Meanwhile, BSolar, a manufacturing firm based in Israel, insists that a further 50 per cent improvement can be made by using double-sided cells. Graphene is one of the most promising technological breakthroughs of recent times. Shaped like a honeycomb, the nano-material comprises a two-dimensional layer of carbon atoms. One feature of Graphene is that it is a superb conductor of electricity, meaning that solar panels could be made smaller and more efficient. Professor Yun Hang Hu explained: “In dye-sensitised solar cells, photons knock electrons from the dye into a thin layer of Titanium Dioxide, which relays them to the anode. “The researchers found that adding Graphene to the Titanium Dioxide increased its conductivity, bringing 52.4 per cent more current into the circuit”. Before warning that too much Graphene can actually reduce the efficiency of solar panels by absorbing the light captured by cells, Professor Hu continued: “The excellent electrical conductivity of Graphene sheets allows them to act as bridges, accelerating electron transfer from the Titanium Dioxide to the photoelectrode”. The professor added that researchers had also devised a reliable method for embedding Graphene in Titanium Dioxide sheets, thereby increasing the potential for Graphene to be used in domestic and commercial solar panel arrays. As scientists and engineers plan to use Graphene to build the next generation of solar panels, BSolar has employed existing technology to improve the energy efficiency of cells. BSolar has produced the “bifacial” cell, which features two sides. One side absorbs direct sunlight in the same way as any other solar panel would, whilst the other side is coated with Boron to absorb indirect or reflective sunlight. When installed in a vertical position, the dual-sided panel is said to be 50 per cent more efficient than a traditional cell. Developments in solar technology offer a glimmer of hope for consumers who are struggling to afford the rising cost of energy. Installed on rooftops, solar panels convert sunlight into electricity that can be used throughout the home or exported to the National Grid.